So it was time for a haircut and I wanted to do something new with my color streaks underneath so this time I went with purple! I can hear my mum groaning now, but check it out! 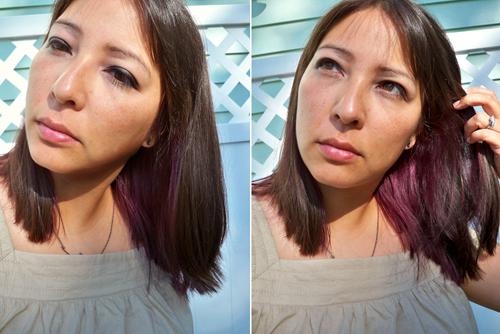 Even though it was a very bright purple it turned out pretty subtle. I like it. The color is really complementary! Looks great on you! Looks great! I'd love to do something like that, but our employee handbook states we can not have any unnatural colors in our hair. Something tells me they would considerr purple unnatural. Damn. Love it! Wish I had darker hair so I could do something like that. It looks great. Did you strip the color first? I ask because my hair is about the same color as yours and colors like that don't take that well . . . or last too long. I have a dark pink now but it only looked like pink for about a day. After that it just looked red. I'd stripped it once to make blue streaks, but as the color wore out, it looked green. Eww.